Even in his best fiction, which for me pales in comparison to his best journalism, you will find more than traces of a man living comfortably in the Who What When Where and Why. He wrote nine non-fiction books from 1965 to 1981, all of them uniquely coddled with a style that rang bells and hit marks, sort of a bizarre combination of rousing endorsement and stinging rebuke on the form without compromise. It was art, man. And that is coming from someone who has spent decades of comparing this “spooky art” – as Norman Mailer put it – to craft. But Wolfe was indeed an artist, because he meant to be. And that’s where it comes down to it for those of us who were fueled on that stuff and chose this course for our own level of scribe-dom. These observations could also apply to Mark Twain and Earnest Hemmingway, two of the most important voices in the emergence of uniquely American letters, both of whom were journalists (Hemmingway’s first novel 'The Sun Also Rises' is a pure work of journalism and he never denied it). 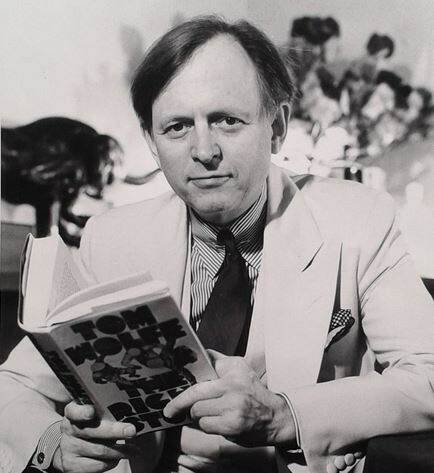 And like them here is also what needs to be written about Tom Wolfe: The environments in which his work was created would not be the same or have the same resonance without Wolfe’s talent to frame them, which was significant and relentless, and if there is a finer more poignant or even goddamn honest thing you can say about a writer of true stories than I have yet to hear or read it. In fact, I would say his New Journalism, a term he coined, wrote diligently towards and acted as its curator for decades, was a thing to behold. It became for me and a whole generation of gestating authors more important than fiction because it is as George McGovern’s Campaign Strategist Frank Mankiewicz opined on Hunter S. Thompson's “coverage” of events in 1972, “the most accurate and least factual account” of things possible. Thompson later mused in his brilliant Fear & Loathing on the Campaign Trail ’72 that objective journalism has failed us. It is what eventually landed a monster like Richard Nixon in the White House, a lesson we had to apparently learn again nearly half a century later. Wolfe understood this better than all of his contemporaries; Norman Mailer, Gay Telese, Terry Southern, Joan Didion, and George Plimpton, all of them in one way or another guideposts that gave voice to this space in the manner in which all of it goes down. This is because Tom Wolfe stood on the high ground, took a moment to look down after a long breath and put the damn thing into perspective. What was happening to the craft? He needed to know. Mailer didn’t. Thompson didn’t. Joan kind of wanted to know but she knew that by asking was to take on too much lifting. But that was long after Wolfe took his first gig at the Herald Tribune a few months before I entered the human race proper in 1962. The Herald hired bright, uber-pretentious seekers then; setting the paper apart from the rest of the steaming crap that boiled up from the subway grates in NYC in the post-war grit of Charles Foster Kane’s “Declaration of Principles”. These were rooms filled with terrible marauders and dime-store lede-driven tacticians that needed the kid to bring the new form. What would that be? Did Truman Capote know when he took that train to Kansas and wrote about wayward drifters who slaughtered a family for a few bucks that was never there? Many said In Cold Blood was the first “novel as fiction”, others, and Mailer would be one of those, would point to his Armies of the Night, which is a princely piece of vitriol that would reverberate from the 1955 founding of the Village Voice in the corner of the White Horse Tavern after too much drinking and way too much revolutionary thought. Be that as it may, I came to Wolfe around the time of Mailer’s breakout through George Plimpton. In the autumn of 1968, my dad took me to see the film Paper Lion in a theater in the bustling Parkchester section of the North Bronx. Not long after, maybe before middle-school, I would read the book. But it was Alan Alda’s depiction of the skinny intellectual trying to make sense of pro football by being a pro football player that had given me my own perspective on what it meant to be a storyteller. It was Plimpton’s work with the Paris Review that then led me to a Wolfe interview in which he revealed methods of combing taped interviews and observations to paint larger pictures of the craft that would have me devouring The Kandy-Kolored Tangerine-Flake Streamline Baby before long. I would eventually find my way to his kinetic The Electric Kool-Aid Acid Test after getting abducted by Ken Kesey’s fever-dream opus, One Flew Over the Cuckoo’s Nest in a high school literary class and I knew that if I could or would make the words work; to heel and parry and spin and dance, it would have to be this way. You see, I got Wolfe right away. This his Wolfe’s gift. He did not mess around. It was his multi-layered command of the language that made him twist it like Picasso’s brush. He could coin “Radical Chic” as easily as the “Me Decade” and it all made sense. It was the way in which he provided clarity to his subjects and gave them meaning. This is what is at the heart, if not a veiled comparison, of my first published book, Deep Tank Jersey – One Man’s Journey into the Heart of a New Jersey Club Band. And although the book reeks of Jack Kerouac and much of the journalism I had studied to get to where that book ends up, it is Wolfe who informs it. It would not have gotten off the ground if not for Wolfe and his New Journalism or the idea of it. It is the ideas that come through and that make us want to read it and to eventually write it because it has to be written, like art.